As temperatures start to warm up and the snow begins to finally melt, it’s time to start thinking about a danger lurking in our own neighbourhoods – TICKS! Ticks are small insect-like animals, usually found on plants outdoors, which bite and attach to the skin, and can transmit serious diseases to you and your pet. Call us to get your dog’s tick prevention started, and read on to learn more! When and Where can Ticks be Found? Where can Ticks be Found? Believe it or not, ticks become active as soon as temperatures reach above 4 degrees Celsius (usually Mid-March or April). They wake up from their winter sleep in search of a blood meal, and they aren’t picky about what type of animal they feed on – dogs, humans, birds, deer etc. Ticks climb up onto vegetation like grasses and branches, and grab onto any passersby as they brush up against them. 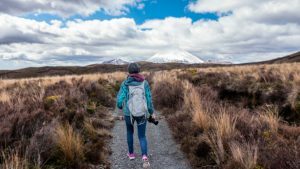 For this reason, you and your pet are more at risk of getting ticks when walking in areas with long grass or other undergrowth like trails, forests and meadows. But we have also found ticks on dogs that never venture further than their backyard or their neighbourhood sidewalks. Some tick species like the Brown Dog Tick can actually live indoors. Ticks spend most of their time in the environment, and only stay on an animal long enough to fill with blood or ‘engorge’, and they do not jump from one animal to another in the way that fleas do. Tick Effects and Tick-Borne Diseases. 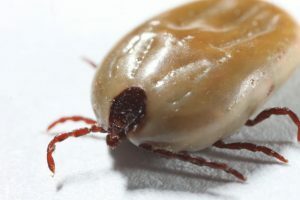 The tick bite itself is generally harmless and most pets don’t seem to be aware that the tick is there. Rarely, certain female ticks’ bites can cause paralysis. The main problem with ticks is that they transmit disease. In Southern Ontario, tick-borne diseases include Lyme disease, Ehrlichia, and Anaplasma. Signs and symptoms of these diseases include general malaise (poor energy, poor appetite), fever, lameness, bleeding disorders (unusual bruising or nosebleeds), and in some cases, neurological signs or neck pain. Signs can appear right away, or even weeks to months later. Tick-borne diseases can be treated, though it may be impossible to completely eliminate the infection from your pet’s system, which means signs and symptoms could reoccur. Keep in mind, these infections can be transmitted to humans as well, but through tick bites, not directly from your dog. Since dogs are hairy and tick bites are not itchy or painful, it is very easy for a tick to go unnoticed. For this reason, regular testing is important to screen your dog for tick-borne disease he or she may have picked up previously. Most tick-borne diseases can be diagnosed using a combination of clinical signs (symptoms) and blood tests. Additional testing may be required in some cases. The 4Dx test is an affordable screening test that checks for exposure to the common types of tick-borne diseases in our area, along with a heartworm test. There is no reliable way to prevent exposure to ticks. Regular tick checks and tick preventative medications are your best defense. Tick checks need to be thorough – brush or comb your dog’s entire body and look everywhere including the head and neck, between toes, inside ears, and the genital area. 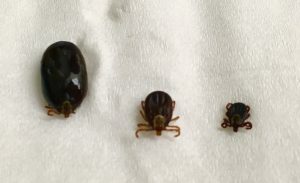 Ticks are dark brown and can vary in size from a few millimetres, to the size of a small grape when engorged, as in the photo below. It is important to choose a preventative that is very effective and kills ticks quickly – before they can transmit disease to your dog. Nexgard and Simparica are effective chewable tick and flea preventatives given monthly. Some other products, applied directly to the skin, are pesticides and can have uncomfortable side effects for your pet and are not ideal. They can also be highly toxic to cats, so should not be used on your dog if you have a cat in the household. Do not try to remove the tick yourself. Bring your dog to the veterinarian for it to be properly removed, and identified to determine what, if any, diseases it could transmit to your pet. If you have a tick remover and know how to use it, you can remove the tick but save the tick in some rubbing alcohol or dry in a sealed container for identification. https://canlyme.com – Canadian Lyme Disease Foundation for information about human tick concerns and how to protect yourself.